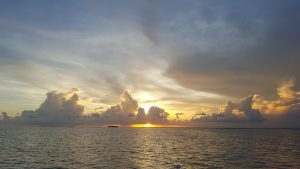 Here at island Ventures its not all about SCUBA diving and Snorkeling we also provide Sunset Boat Trips to witness the amazing sunsets here in the Keys. Our boat departs around an hour prior to sunset and we travel through the Marvin Adams water way right under the US1! You will be able to see all the old coral formations fosilized into the sides of the cutting. Its also a great way to see the Beautiful houses that line the waterway. We travel out onto the bay and up by Gilberts resort and the bridge into Key Largo where we often see Dolphins playing in the fading sunshine. Our journey continues out into the bay where we wait for the sun to set, there is no better view than out on the water! Once the sun has set we make our way back past the restaurants and hotels that line the water back into Marvin Adams waterway. The whole tour takes around 1 1/2 hours and is $55 per person. The tours have a minimum number of passengers of 6 to run and a maximum of 20. So if you are a group looking to do something different to see the sunset ask about our whole boat charter, this, after all, is what memories are made of.